1. Be a student presently enrolled in an Alberta public school. a. How and when the funds will be used? b. What you have contributed financially or in other ways toward your goal? c. What obstacles, financial or otherwise beyond your control, are impeding achievement of your goals? It is important to convey a clear message to the Foundation Directors with your essay. Use as few or as many words as you feel necessary to tell us your story. 3. Provide a letter of reference from an adult other than a family member (educator, coach or mentor). 4. Use the funds allocated for the intended purpose and provide the directors with follow-up. Note: the Foundation will not offer funding for post secondary education. 5. Be a Canadian citizen residing in Canada or permanent resident of Canada. 6. Apply only once in a 3 year period if successful. 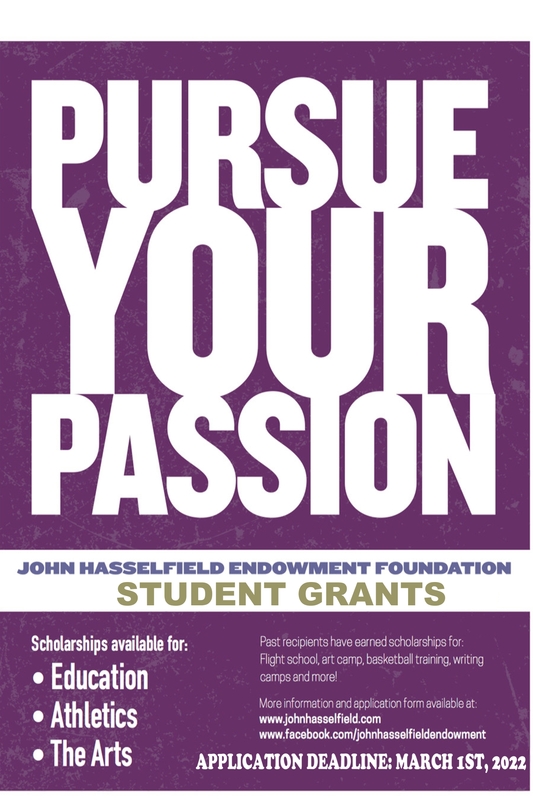 The directors of the John Hasselfield Endowment Foundation choose the successful applicants based on the selection criteria. You may be contacted to discuss your application and to review the details in more depth. Award finalists may be contacted for an interview with recipients being notified within one month of deadline. Applications and documentation will not be returned. Each individual disbursement will be to a maximum of $400 and the Foundation may offer less than what was applied for by the applicant.